Blockchain based platforms and cryptocurrencies are new disruptive technologies that provide alternative methods to increase your net worth and safeguard it, among other services. Until this Tech 3.0 wave, our wealth could only be held as cash in bank accounts, antique cars, stocks, bonds, real estate, art and so on. Blockchain is disruptive because it was designed to do away with purely centralized organizations though community-based decentralized platforms that allow transactions to be recorded on a distributed electronic ledger. In banking, it replaces the need for a centralized bank to house account books to record your assets, or to transact (say to send money from New York to Switzerland), cutting down on expensive and slow back-end technologies. The technology architecture created during Tech 2.0 created unintended costs, where competing organizations house closed (private) databases and make it expensive to interact with other organizations or for people to own their data. Features of the blockchain make these interactions easier, where its decentralized digital ledger allows assets to trade in tokens (cryptocurrency), creating new and unique liquid models. Cryptography, or “crypto” as the cool kids say, has been around since the 19th century. Cryptography is used to encrypt the data passed within the Blockchain using a series of letters and numbers that to a human looks like a long string of mumbo jumbo. When transactions are completed in cryptographic locks, a mathematical algorithm is used to safeguard information. Current computing power would not allow for them to be hacked. Because they are impossible to remember, people often use wallets to keep their keys. For you to receive Bitcoin you provide your wallet’s Public Key, this key provides the information needed to identify your wallet without providing any other information about you, your account, or the sender. Your Public Key “unlocks” your account making it possible to send and receive money. You should never share your Private Key as that is similar to a password but much more, it’s a key that has delegation to send and receive money from your wallet, in a decentralized world only you hold your Private key, not a bank, and if you loose it you have to get a new wallet. Distributed ledgers designed to arrive at the truth by requiring consensus amongst its participants (miners) has allowed the Bitcoin Blockchain to solve the fundamental problem of double spending — bad actors trying to pay multiple people with the same tokens. The double spending problem has been around as long as humans moved from bartering to money, that’s why we use paper money, when I hand you a dollar I no longer have it physically in my pocket anymore, so I cannot try to pay with the same dollar again. In digital transactions, banks must be trusted to ensure double spending does not happen by keeping ledgers in their centralized servers (cloud or physical server farms) and effectively communicating with the ledgers of credit card companies, merchants, and other banks. So a decentralized ledger is simply the idea of needing to reach consensus across peers on a peer-to-peer network, not within one database at a bank. Transactions on the Blockchain occur in blocks of a pre-determined size that are chained together, which give it the name Blockchain. The content of each block, its ledger, is recorded on a number of autonomous computers across the globe, so the “truth” is arrived at through consensus of all the ledgers in a blockchain. Each individual ledger can be thought of as a bank account in which the value of an individual account is noted, additions and subtractions are recorded as transactions for each individual ledger (bank account) in a new block of the blockchain. When a transaction is set in motion, a majority of the computer ledgers must agree that the source account does in fact contain the funds it’s trying to send. This is known as a consensus algorithm. The next block records the transaction and subtracts the amount from the sender, and credits the receiver using each parties Public Keys. Because transactions on the Blockchain are maintained on numerous computers across the globe the system is said to be “trustless”, or said differently, no one person or institution is trusted, instead a large community agrees on the truth. Also, because new blocks are created and none are erased, the data on the blockchain is said to be immutable, or can never be deleted or changed, only updated via new blocks. Remember that this data is not being passed using plain language, instead its encrypted using cryptography rendering the process secure. The computers that produce the blocks on the Blockchain are said to be “miners”. In order to publish the next block, miners compete to solve cryptographic puzzles (a complex math problem), called “hashing”. The faster machines can solve the problems faster, thus computing power reigns king. The work that is done to solve each cryptographic puzzle is said to be the “proof-of-work” used to select which miner publish to the Blockchain. Miners are incentivized by “gas”, or a fee they receive for each successful block they mine. The speed at which they publish, demands different fees, currently blocks on the Bitcoin Blockchain are published in 10–60minutes. Because the cryptographic puzzles are increasingly more complex, more and more energy is used by the computers used to mine Bitcoin, this is criticized as a shortcoming of Bitcoin. New concensus protocols have since emerged to choose who publishes to a Blockchain such as Proof-of-Stake (and delegated Proof-of-stake). They are not fully secure as bitcoin’s just yet. For example Ethereum launched with a Proof-of-work model and will transition to Proof-of-stake per Ethereum founder Vitalik Buterin, but has not done so because he sees issues yet to be solved with Proof-of-stake. Peer-to-peer networking is the backbone that makes it possible to host distributed ledger across various computers, replacing the need for a central point of storage (for example Facebook’s cloud/physical servers, or Santander’s cloud/physical servers). Without this technology the distributed ledger would simply be a book of accounts across different computers that could not talk to each other because they lack a network and therefore could not reach consensus. Peer-to-peer networking technology was first made famous by Napster in 1999, when it replaced the music industry’s distribution model of requiring the purchase of a CD to being able to access music hosted by thousands of computers across the globe. The model disrupted how we do business and technology. The music streaming model stuck, but was made legal by centralized players (Apple, Spotify, Pandora) who could charge users to access the music they host on their servers (and also pay royalties to record labels). The peer-to-peer technology is now similarly displacing the need for centralized servers for businesses beyond music including identification, cross-boarder payments, gaming, and cross-boarder real estate ownership. As shortcomings of the Bitcoin blockchain challenged vendors trying to transact with it (mainly because of its slow transaction throughput and cost) and decentralized app developers trying to build on top of it, various other blockchains have emerged with additional services and fixes. Newer public blockchains include Ethereum, Stellar, Ripple, ESO, Cardano, VeChen, among others. Private blockchains (where individuals outside the organization can not view transactions) are being used in healthcare, government processing, IOT, supply chain, among others. Thanks to Bitcoin, other cryptocurrencies were used as a way to crowdfund development of new blockchains/protocols including Ethereum (through Ether), EOS, Stellar (lumens), Ripple (XRP) among others. And futher alternative coins or “altcoins” built on top of these blockchains/protocols have been used to fund other Blockchain projects. The coins built on top of Ethereum are built to their ERC20 standard created by Ethereum, which allows for trade of these coins across wallets, exchanges (for example Coinbase recently announced they will support ERC20 coins). Blockchain startups like Ethereum was on its inception, have issued tokens in order to crowdfund, this is called an Initial coin offering (ICO). This has been a great opportunity for startups to find alternative capital beyond VCs, and for investors across the globe to get into blockchain based companies. Crypto trading has growth to around $300bn, and $6.3 billion was raised through ICOs in 1Q 2018, surpassing the $5.6 billion raised in all of 2017. As regulators in the US, Europe and Asia have stepped in the focus has moved to a Security Token which is regulated and required to prove its source of value. BitCasas is a new company, making our initial coin offering (ICO) to fuel our marketplace of real estate-backed residential loan investments. 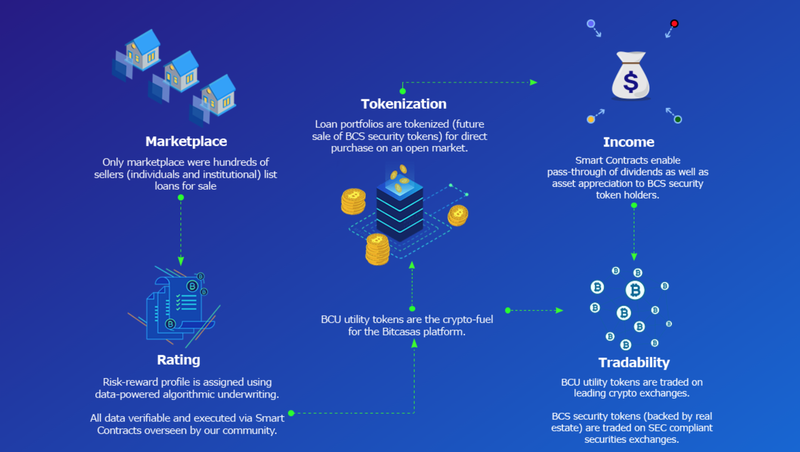 BitCasas uses an algorithm to identify home loans that yield income and capital appreciation into diverse portfolios in different geographic areas. Our portfolio A provides steady income (low-risk/moderate-return), while portfolio B aims for over 12% return by investing in mortgages purchased at a discount (high-risk/high-return), passing on the discount as capital appreciation. See our blog for more details of our investment approach. 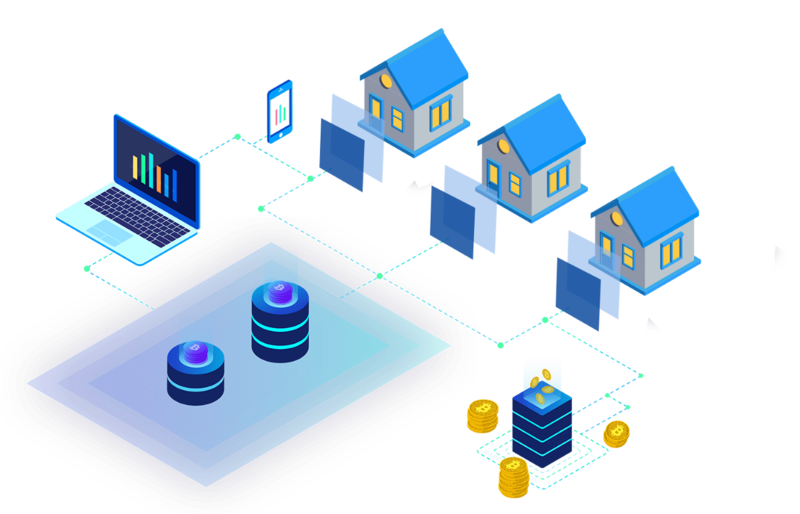 By dividing ownership of a diversified portfolio of real estate loans into tokens, the owners of the tokens lower investment risk and gain liquidity to buy and sell when they want not when the real estate is sold or refinanced. Owners of BitCasas’s tokens can enhance their own financial portfolio by purchasing tokens early on.